Since the day I opened my practice in 2003, I've opted for an al fresco office - in other words, I've chosen to have walking sessions with clients. I walk because I know it moves people - physically and emotionally. Being outside and moving lets the brain relax and those aha moments have space to happen. When I contemplated writing a book about my thoughts on walking and ways to move through life's sticky times, I immediately thought of those fabulous books on my nightstand that I never quite felt like reading after a full day. Naturally, my aha moment came while walking. I knew my work must be shared in bite size bits, so it is doable, non-threatening and does not get left unopened on someone's nightstand. My goal was to create user-friendly, practical, Positive Psychology inspired exercises that can create forward momentum during a short (or long!) walk. 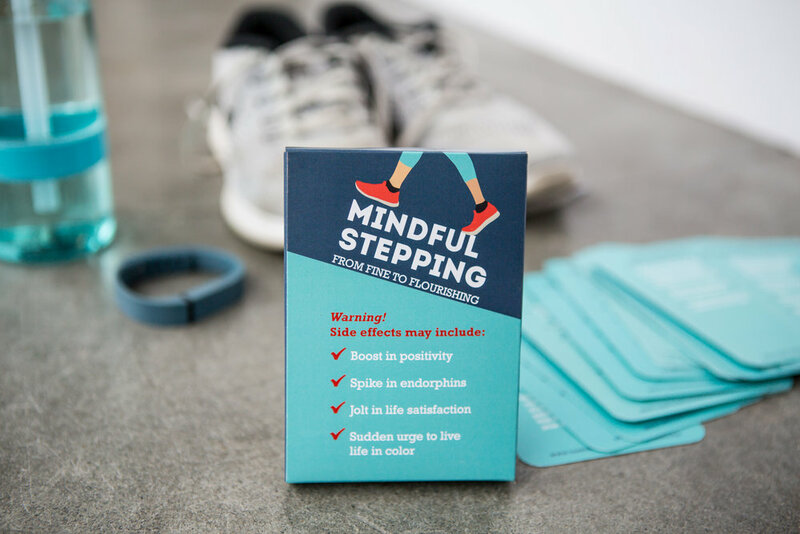 The Mindful Stepping™ deck was the answer. To be the deck of inspiration that individuals reach for when they need a boost in positivity, relationship, confidence, meaning or (quite frankly) any life boost.